We all hear the term SEO, an acronym for Search Engine Optimization, but what does that mean? ? And how is writing for SEO different from other types of writing? Simply put, SEO is the practice of increasing the quantity and quality of traffic to your website through organic (unpaid) search engine results. To achieve good SEO, your website must perform well, visitors must enjoy their experience and, well, people need to be able to find you in their search. So how do you do it? How does writing for SEO work? Where do you start? Over the next few months, we’ll explore many tactics. However, in this post we’ll cover content basics and how you can write for better outcomes. Google and other search engines’ first responsibility is to provide search users with the most relevant possible results. Ranking algorithms are increasingly being controlled by Artificial Intelligence, meaning the rules for content development to achieve high SEO are clear and specific. Courtesy of Moz. 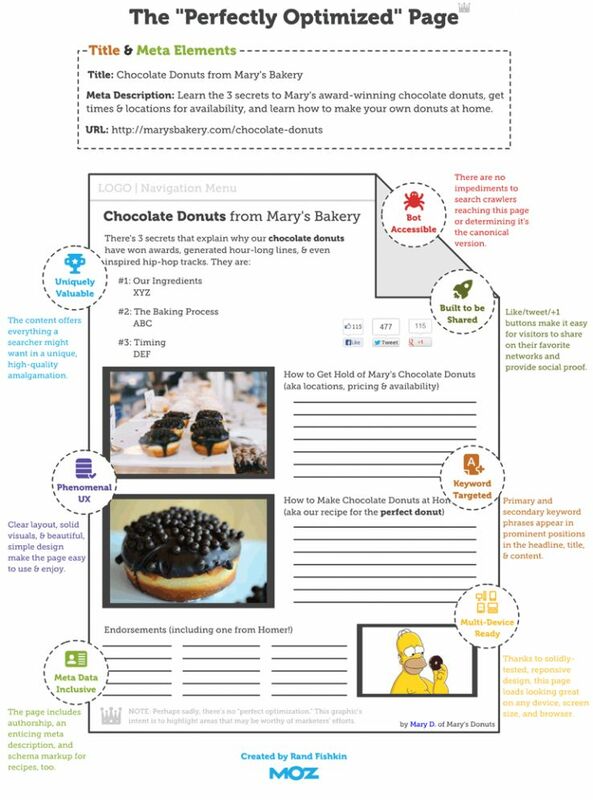 A “Perfectly Optimized Page” for the keyword phrase “Chocolate Donuts” that shows the relationships of keywords across the Page Title, sprinkled through the body copy, on the photo name and alt tag, and the URL. We will discuss Meta Descriptions in a future post. The image links to a printable/downloadable PDF. The title/headline must be simple yet descriptive of the topic. Aim for 8-12 words (max of 60 characters). Be sure your key word or phrase is at the beginning. To improve SEO, use key words or phrases to target your customers and grab a viewer’s interest, while simultaneously informing search engines of your purpose. Often, the URL is created when a headline is entered for a web page. A good URL mirrors the keywords or phrases of the topic. Not only does this help with search engine relevancy directly but URLs are often used as anchor text around the web. For longer content, use sub-heads to reinforce terms that might be used in a search and to further inform search engines of your purpose. The earlier you mention your key words or phrases, the better. Sprinkle them throughout, but not too much. A keyword density between 1-3% is considered ideal. The recommended minimum length of body copy is 300 words. These days, Google prefers longer content, averaging between 1,500 and 2,000 words as the optimum length. Content should be easily readable, unique, authoritative and trustworthy. Paragraphs should contain fewer sentences. Use bullets and lists for easy digestion of tips and facts. Use an active voice instead of a passive voice. With the rise in voice search, searches have evolved into questions, some of which are very long and detailed. Include interrogative words such as how, does, can, where, why, will or what to capture the mood. Add images, infographics and video (where appropriate). An image’s title, filename, surrounding text and alt attribute (an explanation of the photo or graphic for those who can’t see it) all contribute to the SEO performance, as mandated by search engines. Include at least one internal link to another page in your site. A good page is accessible through no more than four clicks from any other page on a site (three for smaller sites). Using descriptive words, clarify where you’re sending a site visitor whenever possible. Click here has not been acceptable for a long time. The number of internal links pointing to a page signifies the relative importance of that page. External links to outside resources help your site’s ranking, provided those resources are high quality, authoritative sites. The more valued the external site, the more value your site is perceived to have in return. See our post, “Top Ten Search Engine Ranking Factors” for more. The Belgrave team is available to help you improve your website’s SEO. We offer full-service website management as well as consultations, and everything in between, including writing for SEO. Contact us for more information and to figure out the right solution for your business. *Note: Items with asterisks are typically completed by a web manager when a page is created in the “back-end” or CMS of a website, but we wanted to fully inform you and stress the importance of each element in search rankings.